Melbourne's grandest and oldest Bridge, Princes Bridge was styled on London's Blackfriars Bridge. Listed on the Victorian Heritage Register, Princes Bridge connects St Kilda Road to Swanston Street alongside Flinders Street Railway Station. A bridge has crossed the river at this point since 1845, the present Princes bridge being the third bridge across the Yarra at that location. The first two bridges built in 1845 (timber) and 1850 (stone) were built in response to a population explosion in Melbourne from several hundred to over 80 000 people, caused by the gold rush. In addition to the increase in traffic crossing the bridge, there was also a need to handle increased shipping traffic on the Yarra River and the river was widened to cope with this. This image belongs to the travel and nature stock photo library. This stock photo of Melbourne, Princes Bridge and Flinders Street Station at Dawn is available for licensing for commercial and editorial uses including websites, blogs, books, magazines, brochures and advertising. Restrictions may apply for images which contain third party copyrighted material or sensitive subjects. Photos of artwork are for editorial use only. 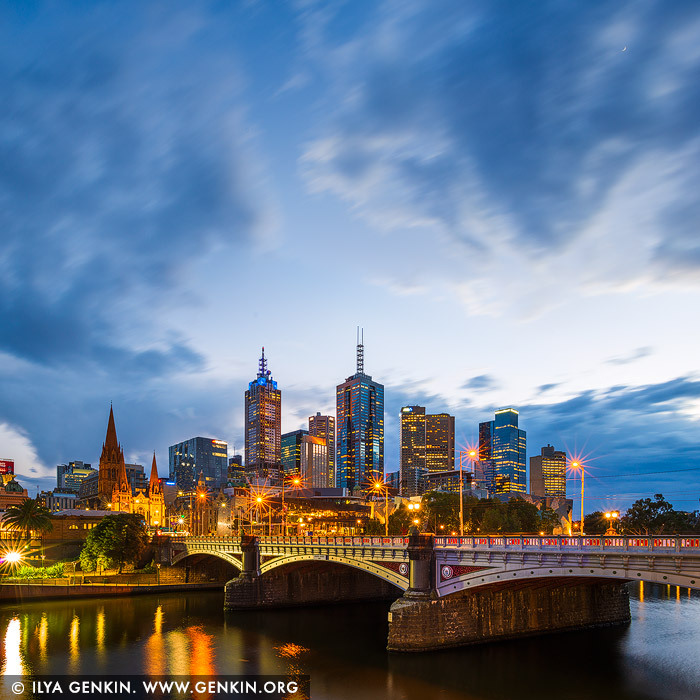 This image id AU-MELBOURNE-0035 of Melbourne, Princes Bridge and Flinders Street Station at Dawn, is copyrighted © by Ilya Genkin. This is not a public domain image.